Ever since he could remember, Gibran Wirjawan has dreamed of being a musician. Wirjawan, a Bienen freshman, joined his first band when he was in third grade. He’s played in bands his entire life, he said, and is now the guitarist for Kodiak Grove, a freshman band that was formed a few months ago. In the past few months, the band has played at the Elbo Room in Chicago and at Mayfest’s Battle of the Bands. This Friday, they will perform on the Lakefill with Slade Warnken and The Ryan Savages. 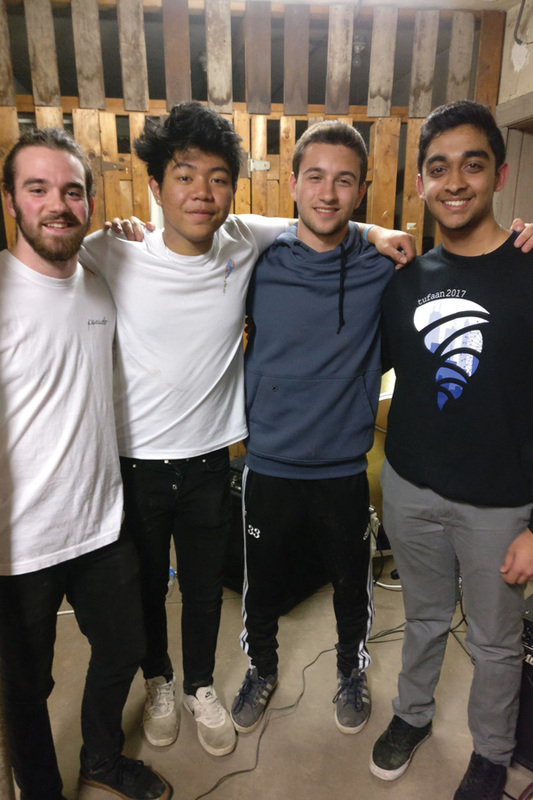 Wirjawan met McCormick freshman Vishal Giridhar and Medill freshman Nick Rueth, the other two founding members of the band, early Fall Quarter. The group started playing music together in November and eventually ended up writing their first full song together in December, Rueth said. From there, they decided to officially form a band. They wrote six songs together in the span of four months, releasing their first album, “Kodiak Grove EP,” in March. “Overall we completely enjoyed it and we’re super happy we came out with this,” Giridhar said. Just like any other band, after they released their album, they wanted to promote it by playing in shows, Rueth said. They needed a bassist, so they began performing with McCormick freshman Tony Leonardi, who was a new member in the same fraternity as Wirjawan at the time, Leonardi said. Through more and more performances, he slowly became a part of the band. The group’s very first performance as a full band was a basement show at 643 Library Pl. in April. The group spread word about the show through Facebook and was shocked when about 70 people showed up, Rueth said. Performing as much as possible is the most important part of being in a band, Rueth said, because it’s the best way to get the band’s name out. People are much more interested in live performances than in a band’s social media presence, he added. For Giridhar, though he hadn’t performed in front of an audience for almost a year, he was able to get back into it because it allows him to express himself. In particular, he enjoys the chemistry that he and the other band members experience when they are on stage, he said. Wirjawan echoed the bond that the group has. He hopes that one day the band will be able to tour professionally and sustain a living out of it, he said.